When it comes to a smartwatch choice, it is sad to know that Apple smartwatch isn't the best one. Recent data shows Samsung's Gear S3 Classic and Frontier are the true winners. Samsung's decision to support iOS for their smartwatches made it rank top in an online market. 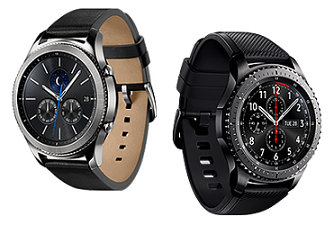 Gear S3 has a big sporty design and more suitable for sports, fitness and travel lovers. Additionally, it is a great phone too. It has an amazing round bevel which allows a user to navigate through various apps just by rotating it. It has a heart rate sensor, two buttons, and round crispy display. Certainly, this model is different than Apple's 2015 successful watch which was a hit in an entire market in that year. One of the major limitation of Apple watches is that the limited support for new developers to utilize their hardware including sensors which they could have used with some modifications. Another bad count was being a non-waterproof, no support for custom dial faces, and their limited functionality. With this, Samsung saw an opportunity with S2 which was a waterproof and much open source for developers to come with custom modifications. Even Samsung's app support is limited for watches and need to come up with more support for new developers. S3 is more for men. It's big and fat. Not like it's bad big but full of features and show off. Its round bevel bezel makes it easier to operate its features and the only thing which facilitate the easiest navigation. Considering features, S3 is full of latest innovation. It has SOS services, GPS, an accelerometer, gyro sensor, barometer, ambient light sensor, a heart rate sensor, IP68 certification for water and dust and what not. In addition to those cool features, S3 has an amazing battery backup. It lasts almost over two full days on Bluetooth and almost over eight hours as a stand-alone phone. At this stage, S3 wins the bet. S3 works perfect and sync nicely with Android apps as well as on iOS devices. You can send health data to phone and access watch through phone easily. Although there are some connection issues seen while it syncs with devices, it calculates accurate data and does a perfect analysis. At the moment you have great watch faces, game themed faces, a bunch of workout apps, games and much more. Also, Samsung Gear smartwatches will gain more from upcoming Android Wear 2.0 and that will bring many improvements to current OS no matter which phone you connected it to.